Farmers Guardian catches up with the Radio One DJ’s to find out more of their involvement with Young Farmers. 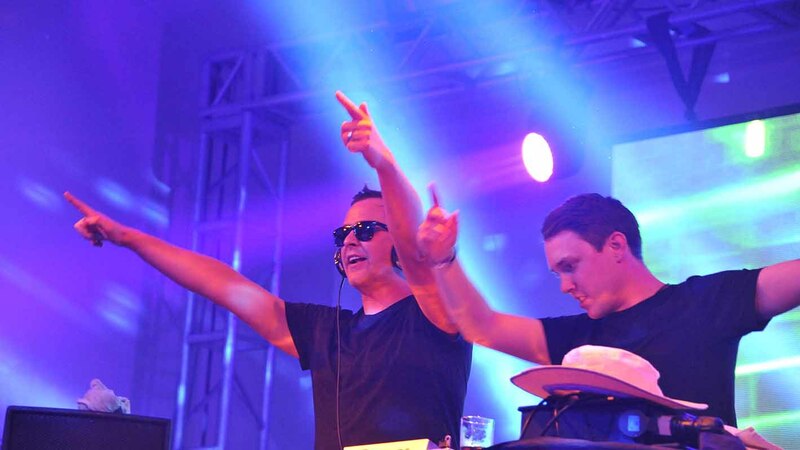 Radio 1 DJs Scott Mills and Chris Stark wowed the crowds on Saturday night, delivering a memorable set as members cheered on. The famous pair have become official ambassadors of NFYC and have even launched their very own campaign, You Only Farm Once (YOFO). Farmers Guardian catches up with them to find out more. Q - What was your first encounter with Young Farmers? Scott: I’ve played tonnes of DJ gigs at farming colleges, but we also get loads of texts from farmers on the show. We’re on Radio 1 from 1pm to 4pm and it always seems that when farmers are on their own, ploughing the fields, they have the radio on for company and text in. Q - How do they compare to other audiences that you DJ for? Chris: Whenever I go to a Young Farmers gig I know it’s going to be crazy, loud and very very fun. They work hard and play hard. Q - Why have you become ambassadors? Scott: There are thousands of Young Farmers entering an industry that is not easy and is facing a lot of challenges – and we want to support the hard work they do, and celebrate it. Being on Radio 1 we are used to young audiences, but the Young Farmers are unique in terms of having one profession that all comes together. Q - Prior to your first encounter with YFC what were your opinions on young people in farming? Chris: I dint realise how many there were! I thought that ‘young farmers’ might be a bloke and his two kids helping on the farm. But there are lots of agricultural colleges across the UK and so many different courses. We have met vets, engineers and the likes - it is a major British industry and one we should be supporting. Q - Why have you launched your campaign, You Only Farm Once? Chris: We know from doing all our different gigs what an amazing community each of the colleges have got and we wanted to put a post out there for all the places we’ve DJ’d and realized that there just wasn’t a central hub. So we set up a Facebook page called You Only Farm Once (YOFO). It doesn’t matter if you’re in college, working on a farm, or just a young person with an interest in farming, it’s a place to chat to each other and get a sense of the community and what’s going on. We just wanted to make a fun space. Q - How does it work and who is in charge of it? Chris: Scott and I run the Facebook page, so it’s a bit of both of us. Q - What do you want to achieve? Scott: Basically just a fun place you can hang out and share photos of cows licking your face! Some people post about fundraising, there are notes about meetings and tractor runs, so it is a mixed bag. Q - How will you help drive awareness of the YFC movement to the wider public? Chris: Talking to other media is one way. We do want to get the message out there. We appeared on Countryfile recently and we talk about farming on our radio show, but there is still work to do in boosting the UK Young Farmer profile. Q - What is your favourite moment with Young Farmers? Scott: When we were introduced at the Empress Ballroom it just went crazy. The noise was deafening, thousands of people were screaming and cheering and there were people on shoulders all over the place. It was like we were headlining Glastonbury!